New York, NY, October 03, 2012 – There's no doubt that it's been an uber hot summer, but that's no reason to assume your autumn can't sizzle too. 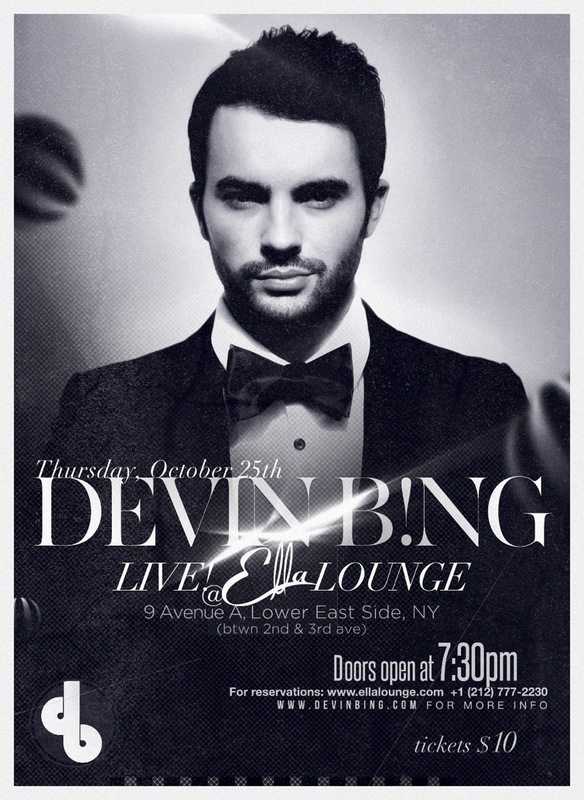 This fall, jazz impresario Devin Bing takes all the action way downtown and hits renowned LES speakeasy-turned-party-spot, Ella Lounge. Ella brings the Old Hollywood glamor of the roaring 20's and 30's to Avenue A, as she captures the energy and flare that made the time period famous. Combining high quality music, alluring design, specialty cocktails and warm staff, there is no surprise that Ella has been featured in such notable publications as New York Post, New York Magazine and sceneskippers go-to Guest of a Guest. So what can the Lower East Side expect from its favorite Brooklyn based songster? Bing plans to announce the launch of his much anticipated album “Shaken Not Stirred,” and perform the LIVE debut of its titled track. Toss in more smooth new material, a splash of spicy jazz standards and a whole-lotta-shakin' and prepare to be served up a tall glass of one fabulous evening. Grooving alongside his smokin’ band “The Secret Service,” Bing elegantly mixes the swagger of a bygone era with his own charismatic brand of urban jazz. Think vintage flare and contemporary showmanship, personified in a melodic feast for the eyes and ears. Prepare to be wowed! Presented by CEG Productions, “Devin Bing & The Secret Service” look to bring a new age jazz vibe to the vintage lounge that is Ella!" So... What do you need to know?